Looking Ahead to Spring Ski Season! historic is a much more accurate way to describe winter in Colorado this year. The Arkansas River basin is at about 145% of normal with regards to snow water equivalent [Figure 1]. These numbers are sure to delight the boating crowd, but they also point to the potential for some amazing spring skiing and riding. 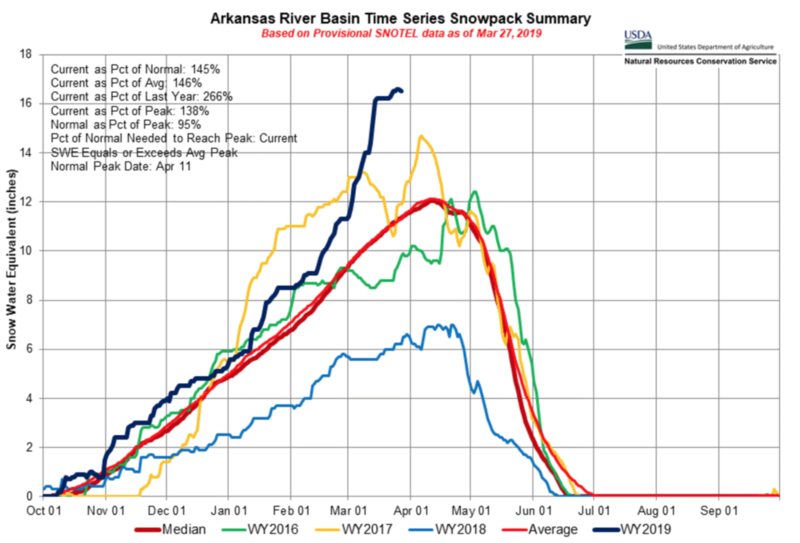 A deep and robust late-season snowpack in the Arkansas Valley is going to lead to one of the best spring ski seasons in recent memory! So what exactly happens to the snowpack as the seasons transition from winter to spring? A process called melt-freeze metamorphism drives this seasonal change in the snowpack, and it has already began affecting the snowpack on sunny slopes and at lower elevations. During this process, water percolates through the snowpack on warm sunny days and then freezes up the snow grains during cold, clear nights. When the liquid water freezes at night it essentially locks up the snow crystals and makes them very strong until the sun and warmer temperatures soften them up the next day. The finished product of melt-freeze metamorphism is referred to as “corn snow” [Figure 2]. On a clear and chilly spring morning your skis or board won’t be able to penetrate into the snow surface because the entire snowpack is frozen solid. The upper snowpack will progressively soften as the sun comes out and the day warms up. When your skis or board sink down a few inches in the upper snowpack then you have found perfect corn! If you find yourself sinking in more than a few inches then it is time to move to shadier slopes or get off steep terrain. Spring riders and ski/snowboard mountaineers take advantage of these melt-freeze cycles to get out and explore big steep lines in the backcountry. Personally, springtime is my favorite time to play in the mountains around Buena Vista; the days are long, the travel conditions are fast [Figure 3] and the snowpack becomes more predictable. Remember that starting early and getting off steep slopes before they get too much sun and become wet and sticky is essential for safe travel when dealing with spring conditions. The staff here at BVMA also loves to take advantage of the amazing spring riding conditions in the Arkansas Valley. This year, we are offering a Ski Mountaineering Skills course from May 3 – May 5 with an AMGA Ski Guide, and will continue to offer guided backcountry ski tours for guests on great lines in the Cottonwood Pass area through May. John is an AMGA Rock & Ski Guide, and partner with BVMA. He lives in Leadville with his wife, Reed, and 8-week old daughter, Eleanor. If there is snow in the mountains, he can usually be found somewhere in the Sawatch Zone with skis on his feet or on his backpack. Being intentional in what and how you pack your backcountry backpack, as well as, periodically going through your pack throughout the season; ensures you won't find that half-eaten PB&J while you are looking for your other glove, and makes certain you have what you need for a safe, fun and successful day in the backcountry. Below is a breakdown of what I generally carry as a guide and a few thoughts on how I pack my bag. *Please note, there are many different schools of thought on how to pack a pack, not to mention, a lot of different gear to choose from. This blog post is just how I pack my ski pack and what equipment I use as a professional guide. Talk to your ski partners; what are they doing? Try different methods for packing your own backpack. What works? What needs improvement? Remember, experience is the best teacher! I have the mindset that what I carry as a backcountry traveler gives me the ability to stay comfortable, safe and handle uncertainty and adversity while I am in the wild snow. Anything can happen in the backcountry, being prepared and having the ability to adapt to an ever-changing environment is paramount. There is however, a balance, you don't want to carry too much either. Think strategically. Strive to have the most amount of tricks with the fewest amount of tools. What items do you have in your pack that serves multiple uses? With bringing the right stuff also comes the responsibility of knowing how and when to use it. Do you know how to use everything you have with you? If you don’t, that's ok, practice. Know how to use everything you carry with you in a non-emergent situation so you are prepared for an emergency—this is important. Now what's in my pack, you ask? I carry the following items with me no matter the day. I may tweak a few things depending on weather, distance, or duration but the 'necessity' items are always in my ski pack. Within the necessity category, I organize into three sub-categories: Rescue & Emergency, Personal Comfort, and Snow Study. I am continually taking note if I used anything out of my first aid kit that may need to be replaced or restocked. • Can you fix your touring rig? • How about your friends? • Will we have to wait for help? • Can we transport an injured person? • Can we build a fire? • A weatherproof shell to keep the wind and precipitation off. Bring what you like and what keeps you going. A little extra is a good thing. Everyone is a bit different here. As a professional, I carry items to help me make snowpack observations as often as needed. I find digging in the snow, checking out layers and tracking the seasons' conditions to be super enjoyable. Anyone adventuring in the backcountry should take an AIARE Level 1 to obtain a basic recreational knowledge of snow observation and safe travel. 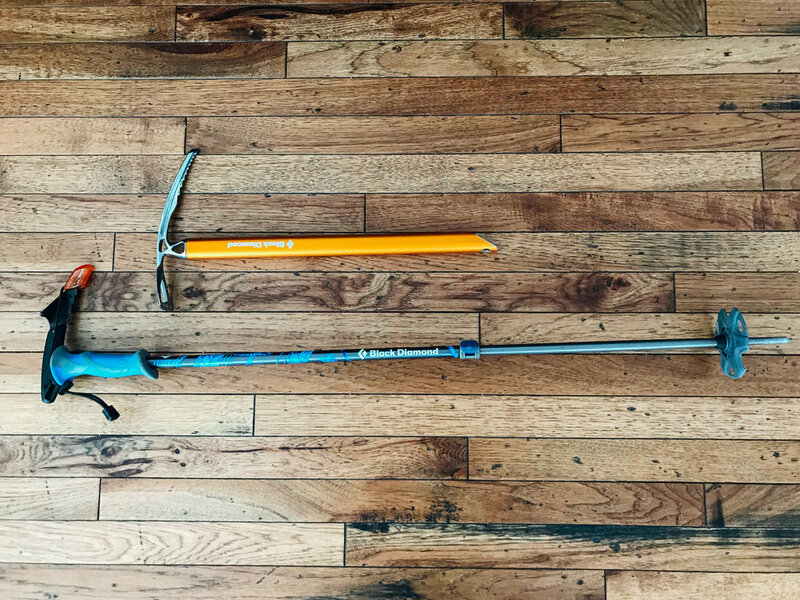 As winter turns to spring and our objectives drift from soft skiing snow to harder, steeper spring lines, we also need to carry a few more tools. Climbing and skiing spring snow can be super enjoyable but has its own set of skills to learn. Make sure to get the training! When the going gets steep, put them on your feet. Your climbing skins may not work as well with hard snow. Ski crampons can be an excellent tool for steep hard snow conditions. Efficiency also means safety in the mountains. If I can have what I need at a moments grasp I have more time to communicate with partners, make observations, and ensure I am on route. In other words, all that time you took looking for your second glove, you could have been talking with your partner about what you’ve been observing on your tour so far. How Quickly can you get to emergency items? Do a deployment drill. Can you get out and deploy your shovel and probe in a matter of seconds? I personally prefer a pack with a dedicated snow tool compartment that is big and easy to get to. What will you need sooner than later or more frequently? If I know it is going to be super windy above treeline, I will put my hard shell and a heavier pair of gloves at the top of my pack etc. Over the past few season guiding, I have also started to keep a few small items that I or my customers may need at the top outside pocket of my pack. Ibuprofen, Bandaids, Blister care items, Cotton tape, Glop Stopper. Planing how my pack is organized has greatly improved the number of times I need to dig things out of the bottom of my pack. What types of transitions will I be making and when? 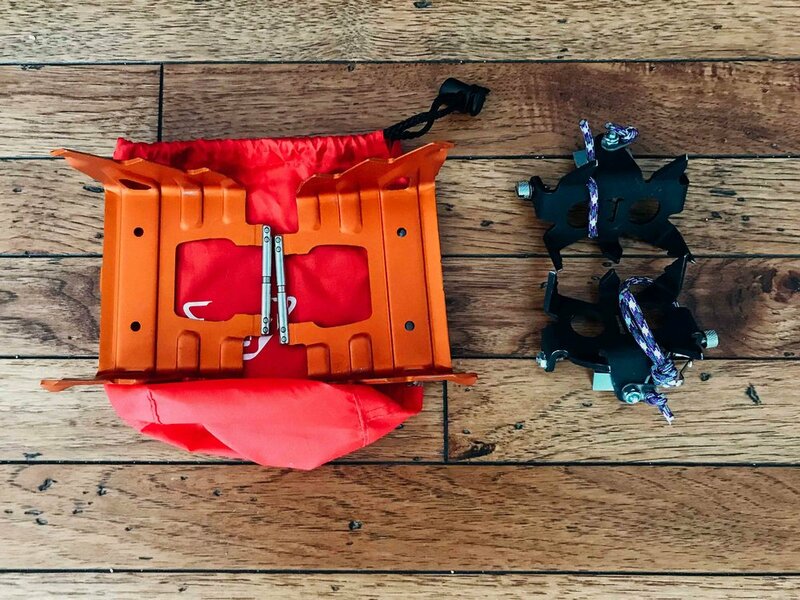 If I know I will have a steep snow climb coming up sooner than later I will put my crampons up at the top of my pack or if there is a high probability that I will need something I will make sure it is easier to get to it. What we bring with us and how we carry it in our pack can greatly improve your efficiency, as well as, your ability to adapt and improvise as needed. Be intentional with your backcountry backpack. Also, don’t forget to periodically go through your pack throughout the season to insure you have what you need for a safe, fun and successful day in the backcountry. Why Invest In Outdoor Education? In the world of outdoor ADVENTURE, many voices are competing for your hard-earned dollar. Web, print, and television advertising continually tempt you to splurge on the latest gear or the best vacation destination of the year. These are reasonable outlets for your cash, but it’s relatively easy to make the argument that there is a potentially more valuable way to improve your outdoor experience than new gear or more exotic destinations. Throughout the history of outdoor sports, those new to an activity have traditionally had a mentor, usually a close friend or family member, who showed them the ropes and taught them the techniques, and also the ethics, of their chosen form of outdoor recreation. This was especially true in the world of hunting and fishing where many of us learned valuable lessons at a young age from a close relative. In the modern world of outdoor adventure sports, and I’m specifically thinking of rock climbing, mountaineering, and backcountry skiing and snowboarding, there is often a different path to gaining skills and knowledge. One of the best, and sometimes the only way, to become proficient and stay safe, is to take a course from a professional guide. Despite the impression that you get from the vast number of gear stores and magazines, climbing and backcountry skiing are niche sports with relatively few serious enthusiasts and even fewer true experts. As a result, not everyone who is interested in becoming skilled at these sports has an effective mentor who can teach them the skills and the decision-making required to enjoy the sport in a fun and safe manner. Outdoor adventure sports are very equipment and knowledge intensive. Navigating trip planning, use, and care of equipment, and related skills like navigation can be overwhelming for anyone, not just the beginners. Outdoor adventure sports also require a long time to get to the point where the participant feels like the skills come naturally, and even longer to reach the advanced or expert level. Anything that you can do to accelerate the learning curve is worthwhile. Complex skills are best learned in a disciplined, systematic environment that follows a “crawl, walk, run” progression from classroom instruction to basic scenarios to outdoor practical application. All outdoor sports, but especially backcountry skiing and rock climbing, have inherent dangers that rarely exist in other sports. Professional instruction provides not only skills but risk management tactics and decision-making frameworks to reduce risks to a manageable level for the participant. Whether you are new to the outdoor adventure world or are a seasoned veteran, mastery of mountain skills is a lifelong pursuit. One of the best investments you can make on this journey is professional outdoor education. BVMA is a proud Colorado Company that is locally owned and operated. Sign up with your email address to receive news, updates and discounts. BVMA operates under permit of the San Isabel National Forest. BVMA is an equal opportunity service provider. Copyright © Buena Vista Mountain Adventures (BVMA), 2015-2019. All Rights Reserved.